XP and Vista cannot reliably validate Authenticode signatures of recent EMET distributions and installed executables. Symptoms are "missing signature timestamps" or simply "bad signature". Windows 7 (both 32 and 64) have no such problems. Tests have shown that both XP and Vista are able to parse all involved certificates. Also, processing SHA256 based digital signatures seems to work. However, either XP and Vista do not support SHA256 signed timestamps, or have problems with some other change in Authenticode structures. Note that this issue is not restricted to EMET, Microsoft is gradually abandoning SHA-1. Using EMET on my system broke my apps enough times that I had to disable it for IE, Firefox, and Adobe Reader. It was causing app crashes with no logs and no evidence that it was the culprit but disabling it or disabling most of its protections (like DeepHooks) fixed the issues. I actually deployed in a corporate environment to over 1000 machines and had no problems. Interesting enough, we did run into issues during testing with some apps crashing. This just required finding the offending mitigation and disabling it. 2) Another thing to note for deployment is that EMET has an "Audit Only" option. This allows for deploying EMET without potentially causing unforeseen application crashes and angry users, and allows IT to monitor event logs in order to get a more realistic view of the impact of EMET on users and to fine-tune the settings for applications prior to switching the mode to "Stop On Exploit". (In the GPO, this is under "Default Action and Mitigation Settings"). Thank you for this post! I started using EMET at home a couple weeks ago with default settings and no issues. I asked our Microsoft premier support rep if he had any good info on deploying EMET in an enterprise and he gave me a PDF describing their 8-week engagement to deploy it (to a pilot group) and also setup Enterprise Reporting Service (to have a centralized reporting dashboard). Has anyone heard of or used this ERS? Could you please let me know whether there is any impact of EMET 4.1 on windows xp SP3 workstations.whether all the setting pushed through EMEt GPO will be inherit by EMEt client.Also what are the negative impact of EMEt 4.1 on Windows xp SP3 workstations. I'm still debating things on our end... 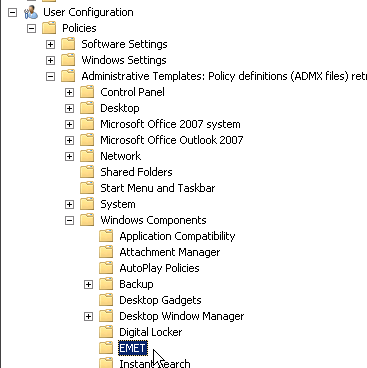 I have to disable a large chunk (not all) of the protections on IE and all the Office components or our AV security suite kills them because it detects EMET's hooks and decides that these programs are being tampered with. Quoting Eric: I'm still debating things on our end... 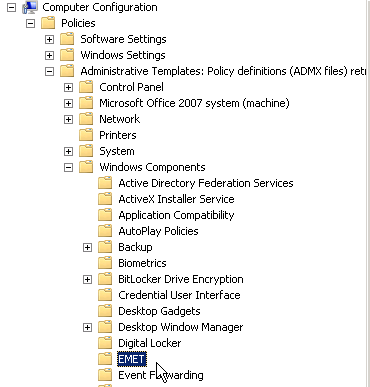 I have to disable a large chunk (not all) of the protections on IE and all the Office components or our AV security suite kills them because it detects EMET's hooks and decides that these programs are being tampered with. Can you add EMET as an exclusion to the AV suite? Quoting KeizerBill: Thank you for this post! I started using EMET at home a couple weeks ago with default settings and no issues. I asked our Microsoft premier support rep if he had any good info on deploying EMET in an enterprise and he gave me a PDF describing their 8-week engagement to deploy it (to a pilot group) and also setup Enterprise Reporting Service (to have a centralized reporting dashboard). Has anyone heard of or used this ERS? I've never heard of ERS. I wonder if they mean SSRS (SQL Server Reporting Services)? In any case, EMET events would usually be logged to the Application eventlog with eventsource=EMET. So, one could use SCOM/SCE or other eventlog tool to capture these event for alerts and/or reporting. Since it was a pilot, it might be they chose to use LogParser (http://technet.microsoft.com/en-us/scriptcenter/dd919274.aspx) to read the events, store them in a SQL DB, and then use SSRS for the reporting. Just a guess. They could mean Microsoft Dynamics - which would report to a dash. MS and CIS recommend using EMET for Server 2012 hardening. Does anyone have any experience and/or thoughts surrounding installing it in a server environment? This would be for servers that have internet access.